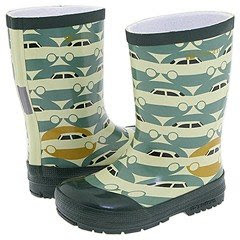 It's been raining buckets around here, and I've found myself wishing the girls had these rubber boots. 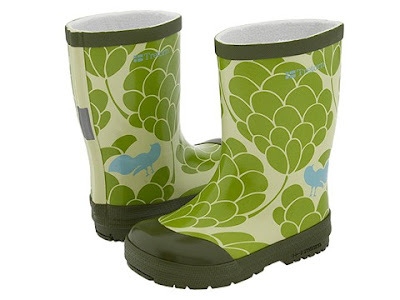 I love that they aren't your average rubber boot design and colors. Once I read the comment about the cars, I had to see them for myself. I agree so perfect for a little boy. Available here. Oh, I just got those for my Sugarlump! They are really good. They have a fuzzy lining, they don't smell like toxic plastic, and they are good and sturdy. My only complaint is that they have a weird tread on the bottom that the mud doesn't come out of, sort of a tiny comma shape. You have to dig it out with a toothpick. I was also worried that the green might look like military drab in real life, but it doesn't. It is a nice spring green.